Crta. Arta - Pto. Alcudia s/n, 7458 Can Picafort, Spanje. Grupotel Gran Vista and Spa is a lovely hotel located in Can Picafort sorrounded by gardens and swimming pools. The complex of hotels and apartments is formed by Hotel gran Vista and Apartments Aldea Gran Vista, where you will be able to spend a wonderful holiday with your family. Grupotel Gran Vista and Spa located in Can picafort, has a wide entertainment programm. It is located just few meters away of the nice playa of Picafort, and it boasts a Spa and Wellness area which is enviable in this area of Mallorca. It is one of the Spa hotels more importants of the chain. Grupotel Gran Vista and Spa received the international certificate ISO 14001 for being environment friendly. 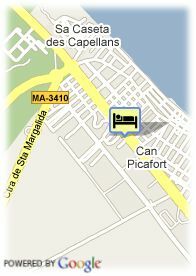 This and other recognitions makes this hotel on of the most popular establishments in Port d´Alcudia and Can Picafort.